It would be a lot easier to explore the deep ocean, if we only had some electrical outlets and phone jacks on the seafloor. With 21st century technology, we are starting to installssome. On land, earth scientists can plug their instruments into electric power lines or rig them with solar panels to make long-term measurements of earthquakes, the planet’s magnetic field, and other episodic or ongoing geophysical processes. But many of Earth’s most fundamental, planet-shaping processes occur only beneath the ocean, where deploying similar instruments has presented unique challenges. Expeditions to remote ocean regions are typically more expensive and time-consuming than land-based expeditions. Marine scientists are also limited by the availability of ships and must contend with corrosion problems peculiar to ocean environments. And without sunlight or a continuous electricity supply, scientists have had a limited capacity to supply power to instruments and data recorders in the ocean. As a result, the record of land-based measurements contrasts starkly with the near-total absence of long-term geophysical data from the seafloor. Instead, ocean scientists tend to have a lot of snapshots of what is happening in the ocean. Since three-quarters of the earth is covered by ocean, that’s like trying to monitor the dynamics of a household by observing events for just a few hours a month in only the living room and one bedroom. To comprehend Earth’s dynamic behavior, ocean and earth scientists must do more than observe small regions for short periods. Advances in communications, robotics, computers, and sensor technology now make it possible to get wider and longer views of the oceans. Remotely operated vehicles (ROVs) and autonomous underwater vehicles (AUVs) can work longer and deeper, and with ever-growing abilities. Fiber-optic cables and other communications technologies allow more data to be transferred at greater speeds. And with new materials, we can develop hardy instruments that can withstand harsh seafloor conditions. Establishing a long-term presence in the oceans is no longer a dream. At the H2O “cabled” seafloor observatory (midway between Hawaii and California), the world’s second deep-sea science station has been setting a new scientific precedent since 1998 (the first was established off Japan in 1993). 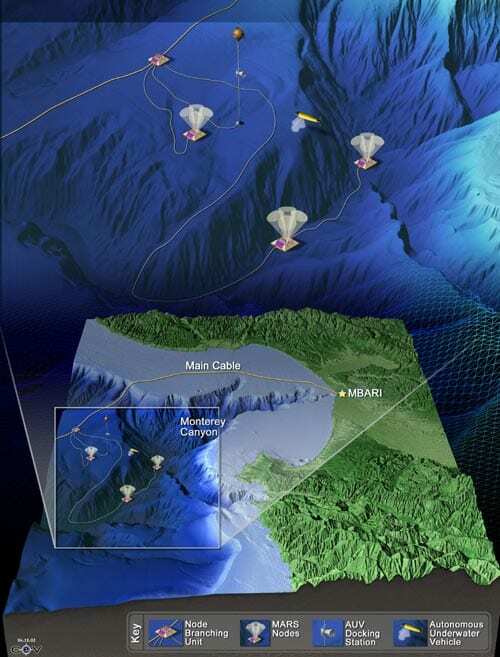 Next year, the Monterey Accelerated Research System (MARS) project will begin full-time observation of phenomena in Monterey Canyon off California. 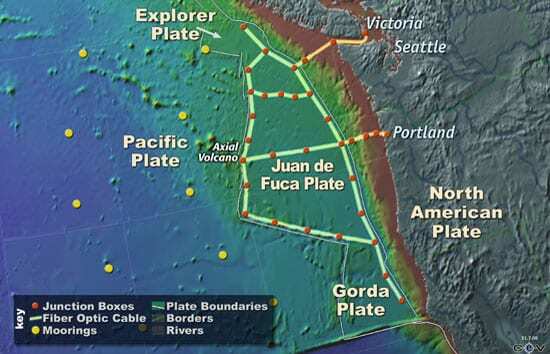 And by the end of the decade, ocean scientists hope to wire and network an entire tectonic plate for observation through the North East Pacific Time-integrated Undersea Networked Experiments (NEPTUNE) program. These initial outposts on the ocean frontier will allow us to examine in detail the interactions that shape the seafloor, generate earthquakes, fuel volcanoes, form ore and oil deposits, transport sediments, circulate currents, and support life in deep-ocean environments. Bringing the power of the Internet to the seafloor, these cabled observatories will connect scientists in their labs directly to submarine experiments. Scientists will be able to monitor and adjust instruments, or to dispatch AUVs to observe episodic events that previously went undetected. These observatories will also offer students and the public an unprecedented, intimate view of ocean exploration in action. 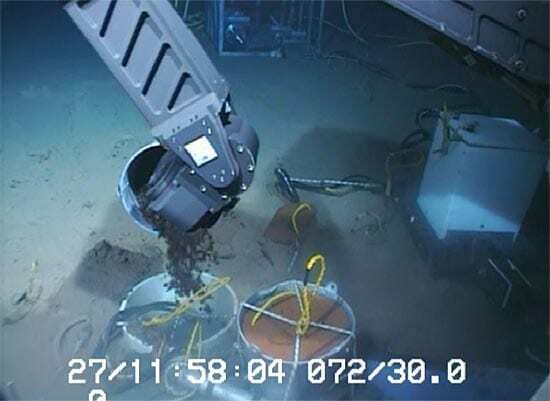 In 1998, Woods Hole Oceanographic Institution (WHOI) and University of Hawaii researchers seized an opportunity to take a significant first step toward opening the relatively unexplored submerged regions of Earth to more thorough examination. Beneath 5,000 meters of water (16,400 feet), a submarine telephone cable called Hawaii-2 (HAW-2) stretched across the seafloor from Hawaii to California. AT&T laid the cable in 1964, but when it broke in 1989, the company looked to its fiber-optic future and decided not to fix it. Instead, they donated the cable to the scientific community. The HAW-2 cable is like a long extension cord delivering electrical power to the seafloor and providing a means for two-way, shore-to-seafloor communications. With funding from the National Science Foundation (NSF), a WHOI/Hawaii science team developed and built a junction box to be spliced into one end of the HAW-2 cable. The junction box is like an eight-socket power strip for the seafloor. No longer constrained by battery power and limited data recorders, we could install instruments to take continuous measurements of slowly evolving Earth processes and rapidly occurring events. The dream of America’s first long-term, deep-ocean observatory became a reality with the establishment of the Hawaii-2 Observatory, or H2O. The first two instruments plugged into H2O included a seismometer and a deep-water pressure gauge. The seismometer records seismic waves generated by earthquakes, allowing scientists to locate and study the sources. The pressure gauge aids researchers in detecting tsunamis, large waves generated by earthquakes in the open ocean. In the summer of 2003, H2O got its first renovation. The junction box was raised, upgraded with the latest communications and power interfaces, and lowered again to the seafloor. In 2005, several new instruments are scheduled to be installed. Magnetometers and other instruments will be set up as part of a seafloor geomagnetic observatory. A new benthic biology experiment, which includes digital cameras and sediment traps, will be able to observe what is living on and falling to the deep ocean floor. A 1.5-kilometer (1-mile) cable will be laid from the junction box to a borehole where another more sensitive seismometer will be deployed. The next step for deep-ocean observatories is to incorporate fiber-optic communications, allowing high-speed, high-bandwidth transfer of science data and computer commands. 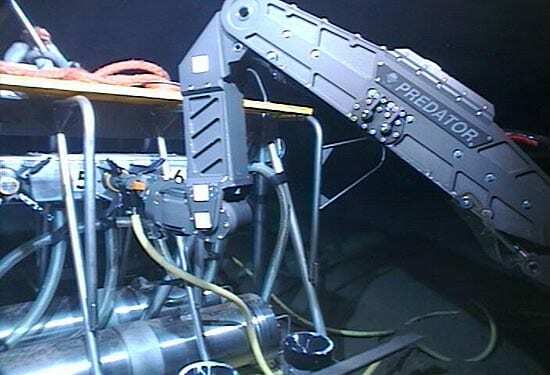 In the fall of 2002, NSF provided the funding to build a test bed for fiber-optic cabled observatories—a proving ground for the next generation of seafloor observatories. The Monterey Accelerated Research System (MARS) will consist of 70 kilometers (44 miles) of submarine cable laid out from a shore station along the northern side of the Monterey Canyon to a single science node located 1,200 meters (almost 4,000 feet) below the ocean surface. The science node will serve as a power and data-transfer station for instruments. Ocean scientists from around the world will be able to design new instruments and then test them by plugging into one of MARS’s four standardized ports. Each port will support data transfers of up to 100 megabits per second—comparable with some of the fastest land-based commercial data networks. The cable also will supply up to 10 kilowatts of power—enough to supply a few terrestrial houses, and several orders of magnitude more power than can be supplied with batteries. Partners in the MARS program include the Monterey Bay Aquarium Research Institute (MBARI), Woods Hole Oceanographic Institution, the University of Washington (UW), and National Aeronautics and Space Administration’s Jet Propulsion Laboratory (JPL). 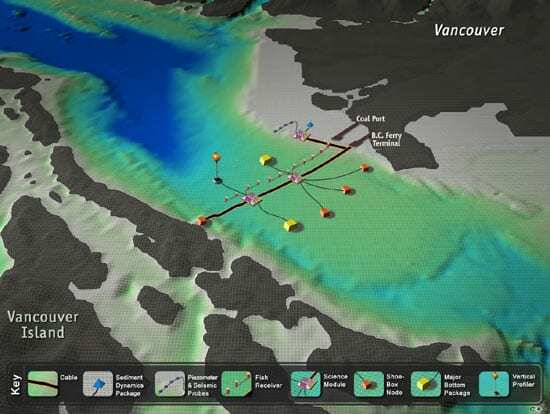 The University of Victoria (UV) is simultaneously developing a complementary shallow-water test bed—known as the Victoria Experimental Network Under the Sea (VENUS)—in the Strait of Georgia and Saanich Inlet between Vancouver and Victoria, British Columbia. Just off the coast of the Pacific Northwest of Canada and the United States lies an ocean scientist’s dream. Nearly all of the major Earth-shaping features and processes—seafloor volcanism, hydrothermal vent systems, earthquakes, seafloor spreading, and subduction zones—converge in a reasonably small geographic area. At its coastal edge, sediments from the North American continent pour into the deep sea, while the waters teem with life in the Pacific Northwest’s great fisheries. 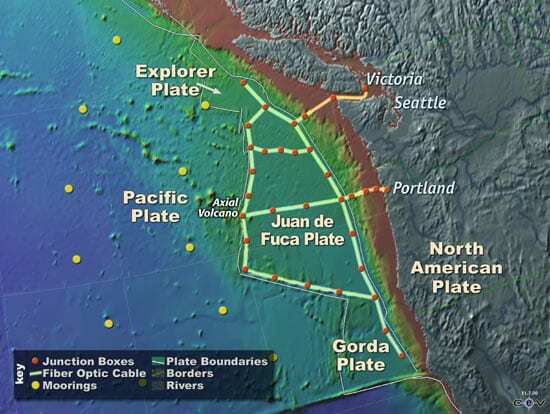 Quite simply, the Juan de Fuca tectonic plate is a comprehensive natural laboratory for ocean science. The plate’s proximity to shore and relatively small size make it a cost-effective candidate for incremental but eventually extensive cabling. 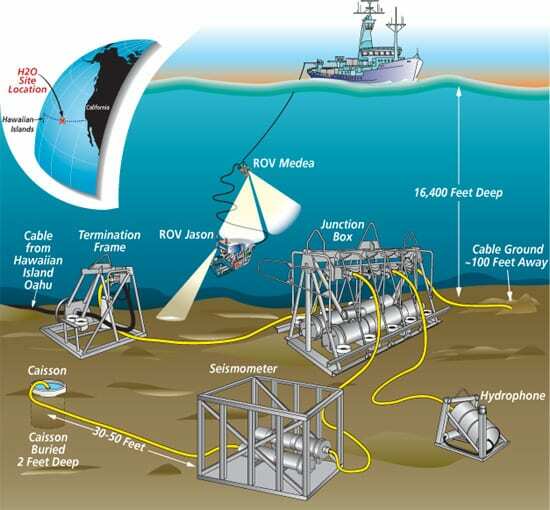 The North East Pacific Time-integrated Undersea Networked Experiments (NEPTUNE) project aims to establish an extensive earth/ocean observatory across and above the Juan de Fuca Plate off the West Coast of the United States and Canada. Researchers are proposing to lay down 3,000 kilometers (1,865 miles) of high-speed fiber-optic submarine cables that will link a series of 30 seafloor nodes, each about 100 kilometers (62 miles) apart. Those nodes would support thousands of assorted measuring instruments, video equipment, and robotic vehicles that could upload power and download data at undersea docks. Unlike conventional telephone cables, which supply power from shore in a straight line, end to end, NEPTUNE would operate like a power grid, distributing power simultaneously and as needed throughout the network. More than 100 kilowatts of power would flow through the system (roughly the amount of power needed to supply 50 to 100 homes at any given moment). NEPTUNE would work much like a campus data network (with nodes analogous to buildings and each instrument like a computer workstation). It would provide real-time transmission of data and two-way communications for up to 30 years. Developers of the NEPTUNE network includes many of the same institutions involved in previously mentioned observatory initiatives (WHOI, UW, JPL, MBARI, and UV). We hope NEPTUNE is operational by 2008. It will cost approximately $200 million to develop, install, and operate through the first five years. An entire network of seafloor instruments, distributed over an area of 500 by 1000 kilometers, would cost less than one satellite or one Coast Guard icebreaker. Jason?s arm pours glass beads into a container used to bury a seismometer beneath seafloor sediments. MARS (Monterey Accelerated Research System)—The next step for deep-sea observatories will be MARS, a test bed using a fiber-optic cable that allows high-speed, high-bandwidth communications and data transfer. MARS will have a 40-mile cable along the north side of the Monterey Canyon, connecting a shore station to an undersea node that serves as a power and data-transfer station for instruments. VENUS (Victoria Experimental Network Under the Sea —The University of Victoria is developing a shallow-water undersea observatory called VENUS in the Strait of Georgia between Victoria and Vancouver.